Stott Pilates' "The Secret to Weight Loss, Vol. 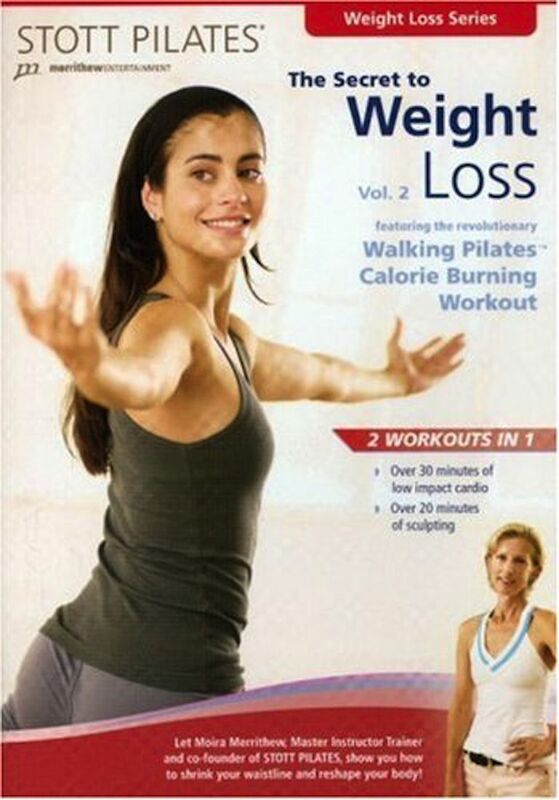 2" is Pilates DVD workout that includes a moderately-paced walking Pilates routine followed by a series of mat exercises. This is a great DVD for beginners who are already somewhat familiar with Pilates and want to incorporate some cardio into their exercise routine. Volume 2 is the subject of this particular review. Volume 1 is similar but easier option that is appropriate for seniors and those who want to take it easy at first. The Secret to Weight Loss, Vol. 2 Walking Pilates Calorie Burning Workout. The lengthy title begs a few questions: Is there a secret to weight loss? What is walking Pilates? What makes it a calorie burning workout? There is no secret to weight loss. If you're healthy, a combination of a healthy diet and exercise will promote weight loss. Increasing the exertion level of exercise by increasing difficulty or duration burns more calories. The workouts in this DVD present a moderate difficulty and duration challenge for beginners. I've been practicing Pilates and cardio exercise for quite a while now, so this program was not challenging enough for me to feel like it was a significant calorie burner. This DVD might not live up to its big title, but you might like it if you're looking for an easy way incorporate cardio into your home workout. The walking portion and Pilates mat exercises are clearly presented, and I think a wide range of beginners would feel comfortable with them. Finally, what is walking Pilates? There is no traditional form of Pilates that is "walking Pilates." In this case, walking Pilates means paying attention to movement and keeping good form with regard to posture. That's it. The "walking" is mostly marching with some simple forward and back or side-to-side moves. The Pilates exercises are considered beginner level, but they do not lead off with fundamentals or show many modifications. If you are just getting started with cardio workouts and you want to combine that with the stretch and strength benefits of Pilates mat exercises, this DVD will fit the bill.